Prevent sewer system problems with pipeline testing and cleaning from our company in Belford, New Jersey. At Oswald Enterprises Inc., we perform services that ensure your infrastructure functions optimally. Our fleet of VAC-CON® combination units facilitates light cleaning by their simultaneous jetting and vacuuming of debris. The jet is capable of removing grease, sand, mud, sludge, rocks, debris, and much more from pipelines. Extreme grease conditions, roots, etc., are rendered routine by this service. We utilize a wide range of root cutters and pipe cleaning nozzles to handle heavy dirt or root conditions. 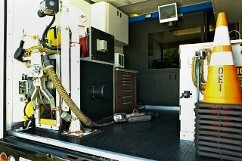 For heavy sediment or larger diameter pipes, we use our 80 or 120 GPM Vac-Con trucks. This straight forward task prevents storm sewer blockages and minimizes the amount of pollutants that enter the sewers. Liquid Waste Removal - Our 3,000 gallon tanker is available for emergency service to meet any sewer overflow, pump station failure, or any sewer line failure. Bypass Pumping - If your pipeline collapses, we have the expertise to handle flows from thousands to millions of gallons per day (GPD) in a routine manner. Contact us for proper care of your sewer systems.